UN’s ICAO historically agrees to a Global Market Based Measure for Aviation Emissions | MONITOR. REPORT. VERIFY. A landmark global aviation emission reduction scheme was passed by the U.N’s International Civil Aviation Organisation (ICAO) on Thursday 6th of October. The agreement which has been hailed as the first of its kind for a global industry to reduce emissions within its sector has been marked as an historical moment. Every three years the countries that form the ICAO meet to discuss and implement international safety regulation amongst other items on the agenda. Global emission reduction targets have been at the forefront of these discussions for many years and the 39th assembly has been no exception. In 2012 the European Union (EU) decided to include aviation in its Emissions Trading System (EU-ETS), which is known as the largest emissions trading system in the world. The inclusion required airlines and private aircraft operators to Monitor, Report and Verify (MRV) their annual emissions together with purchasing and surrendering the associated carbon emission units equivalent to those calculated for the year. The move caused huge controversy and was met with backlash from international states over sovereignty as the EU incorporated flights to and from non EU member states. As a result of this, the EU temporarily relaxed the legislation to exempt such flights in an attempt to provide ICAO with additional time to develop their own global reduction system. On September 27th through to the 7th October 2016, 191 nations met for the 39th Triennial Assembly at the U.N headquarters for international aviation in Montreal. On the 6th October, Item 22 on the agenda was finally recommended for adoption on the final resolution text for a GMBM which is now known as CORSIA (Carbon Off-setting Reduction Scheme for International Aviation). The resolution will act as one of a basket of mitigation measures for reducing Co2 emissions within the global aviation industry. On this historic day, 65 nations representing more than 86.5% of aviation activity agreed to voluntarily participate in the pilot phase and first phases of CORSIA, which will begin from 2021 through to 2023 and 2024 through to 2026 respectively. The second phase, 2027 through to 2035 would see all countries on board however some exemptions would be in place for Less Developed Countries (LDCs), Small Island Developing States (SIDS), Landlocked Developing Countries (LLDCs) and other countries that do not meet the criteria for international aviation activity. 3. What type of off-set projects will be eligible? 4. What type of emission units will be accepted? or will there be a different emission unit. EU ETS – The temporary reduced scope legislation is due to expire at the end of 2016. For those operators who are affected by the EU’s ETS, for the moment everything will remain the same and operators will follow the current MRV legislation as normal, at least until the EU has had time to deliberate on the ICAO decision. The EU will consider the ICAO agreement and discuss the voluntary aspects of CORSIA to see if they are strong enough. We are not expecting a decision until early next year on whether the EU will reintroduce the full scope EU ETS to include flights to and from non EU member states or whether to extend its temporary legislation to exempt such flights. Patchwork Legislation – International operators should be aware of patchwork legislation to MRV their Co2 emissions within other countries. 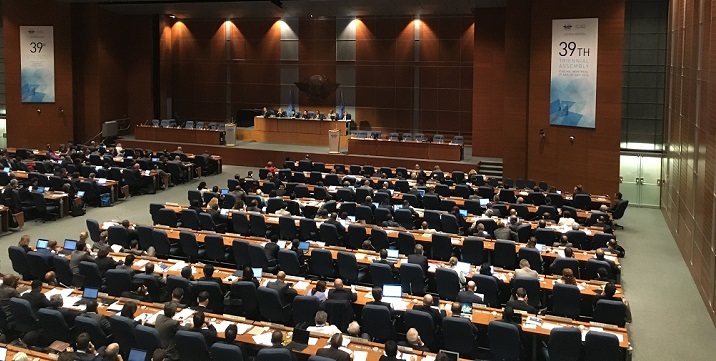 Through the course of the ICAO conference some states have expressed a decision to regulate domestic Co2 emissions from aircraft until the pilot phase of CORSIA is implemented. Domestic aviation will become part of the New Zealand and China ETS as early as next year and together with the findings from the U.S Environmental Protection Agency (EPA) other such legislation may follow before a global emission regulation is in force.